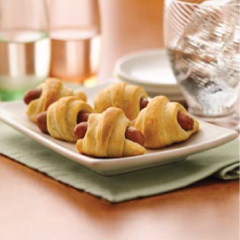 Cute little sausage or hot dog bites. Great party food! Place sausage on shortest side of each triangle. Roll up each, starting at shortest side of triangle and rolling to opposite point; place point side down on 2 ungreased cookie sheets. Serve warm with ketchup or mustard dipping sauce.